August 13, 2011 / New York -- Today we bought tickets online at Fandang.com to see the movie Rise of the Planet of the Apes at the AMC Loewes, Lincoln Square. It's located on the Upper West Side at 1998 Broadway between 67th and 68th Streets just a couple of blocks from Lincoln Center. We took the easy 1-mile walk from our apartment on 49th Street with the plan to grab a bite to eat before the movie. 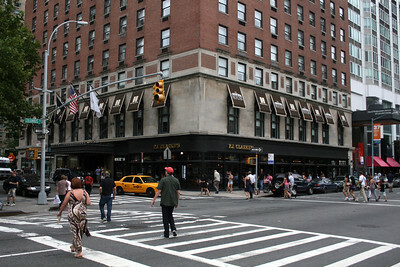 We had plenty of time, so we stopped in at PJ Clarkes Restaurant a couple of blocks from the theater. Gary ordered a Waldorf salad and Joe had a hamburger. The salad was very good and Joe's hamburger was mediocre. It was definitely over-priced. Hey, what about the movie? Simply put, this was a good movie. I had not been a big follower of the earlier series of movies from the 1960s and so was only slightly aware of the story. This, being a prequel did a really good job of setting up the plot for the later (already told) stories. There were a few far-fetched concepts and situations which were a bit impractical, but they were easily ignored. The movie-making quality was very good. CGI was excellent, acting good. Both Joe and I recommend seeing it.